Old School. After one got used to all these notebooks with wide screen and mingles with these all the time, the exactly 15-inch Toshiba in 4:3 format seems quite weird. This impression recedes only after some time. It's really strange, just a little while ago all laptops were like that. Satellite L100's appearance is peculiar to all Toshibas of this class (which is now being replaced by the new generation, though). Accordingly, one will notice some common elements of Satellite's design: a streamlined base unit , a silver top case, a black keyboard and a charcoal grey back panel. The workmanship seems good or at least satisfactory. Considering the robustness, we look at two different aspects: The base unit is flawless. Its bottom side is made out of very solid plastic, which only deflects just a little bit at the DVD drive (and solely at the part closer to the computer's front). On the other hand the stability of the lid is worse. 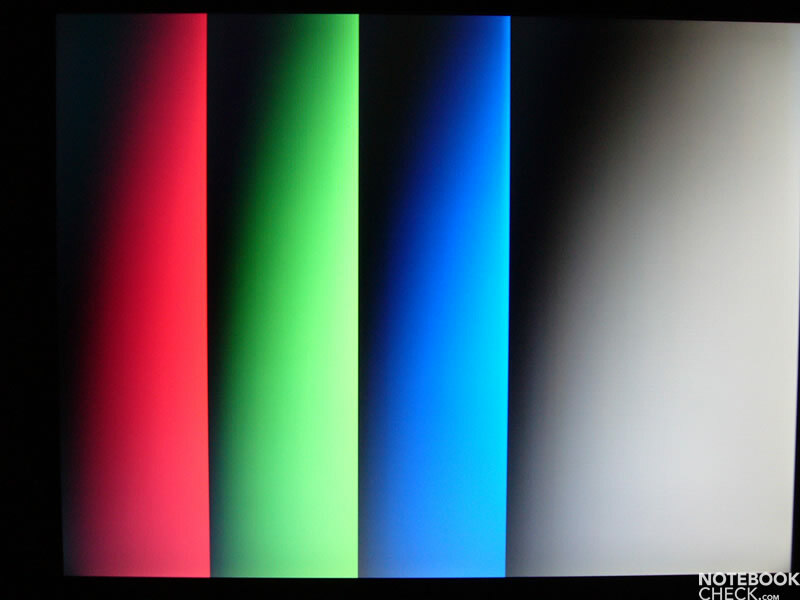 The 4:3 is not very stable, because the screen's height is bigger compared to the more horizontally stretched wide-screen one. 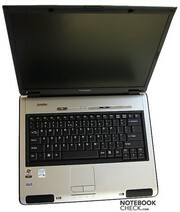 Therefore, it is an advantage regarding this matter that the laptop producers decided to discard this format. The back panel heavily deflects under pressure accompanied by creaking and even clatter. 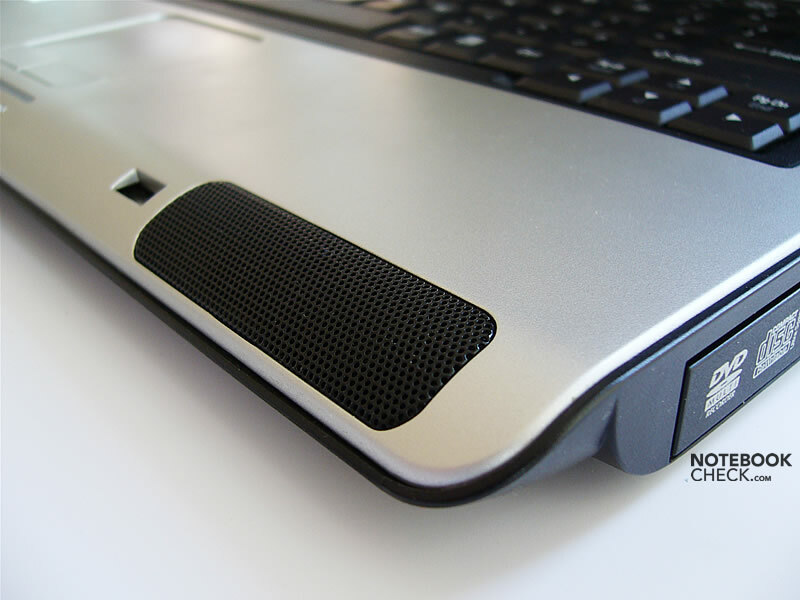 It ought to be mentioned, that by separating the battery from the computer one removes the right rear foot. 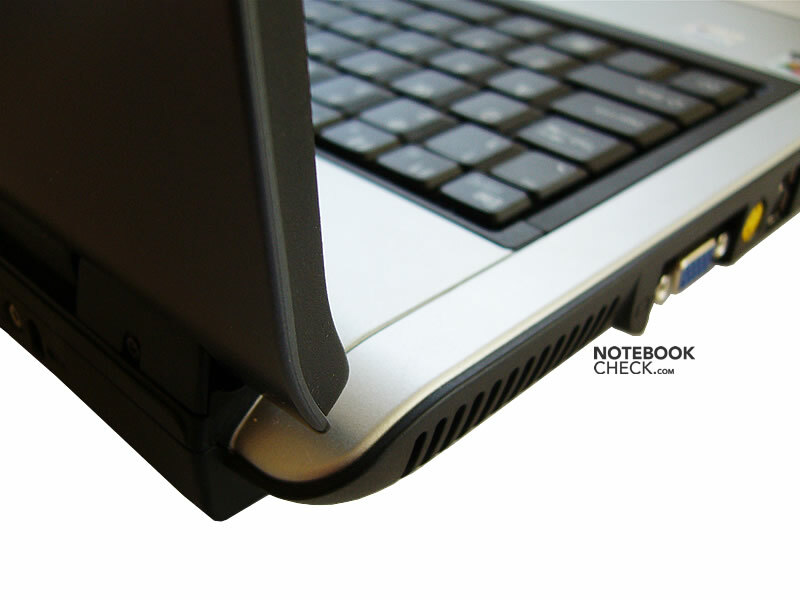 As a result the laptop loses stability. This is a quite serious drawback, because after working with the power adapter for a longer time, one should disconnect the battery. 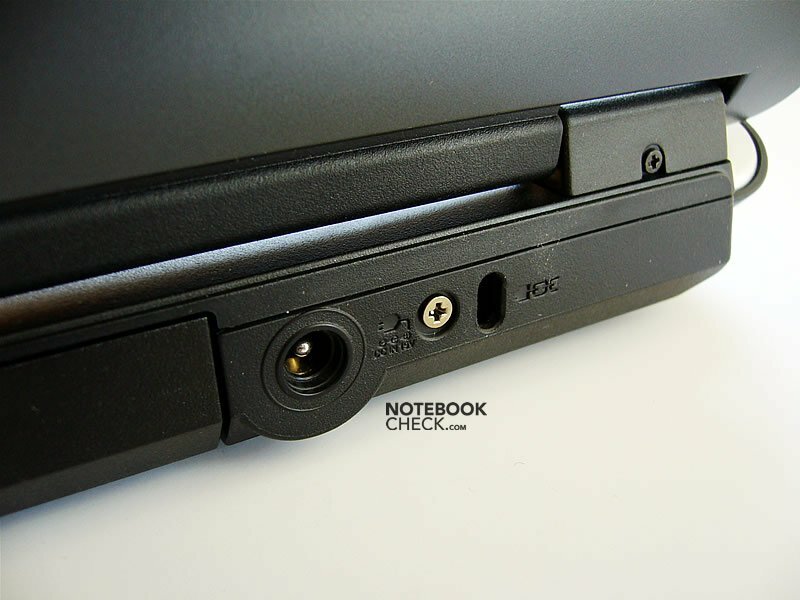 The hinges are not as good as expected - the screen see-saws quite heavily after adjusting its position, and also while shifting or moving the notebook around. The locking mechanism requires that you press the already closed lid down in order to get it locked. The bolts don't lock it tightly, so, the display still wobbles a little bit after being locked. 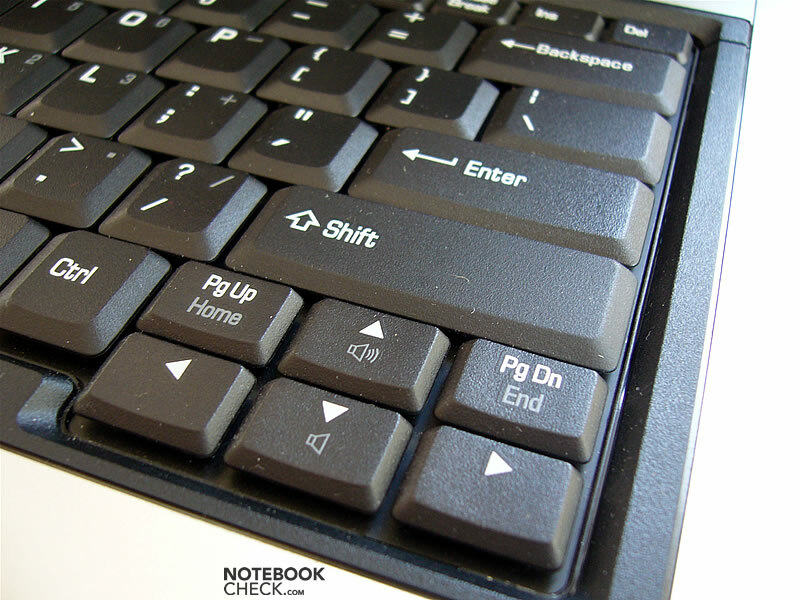 The interfaces are placed mainly on the left side of the notebook, which is not comfortable for left-handed people. Here, another problem of the older display format gets apparent - it is narrower, so there is less space to locate interfaces at less troublesome places. Besides the battery, there was only space for the power connector and a Kensington Lock at the back of the Satellite L100. 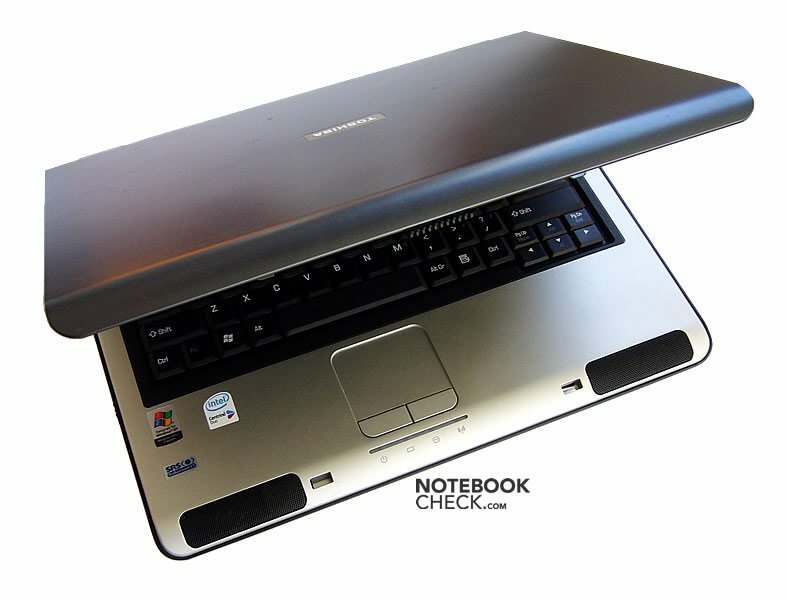 As the base unit is narrower compared to notebooks with wide screen, also the keyboard has to be narrower. It is obvious that the keys have to be ordered compactly, without any lines of separation. So, the layout reflects the limited space. 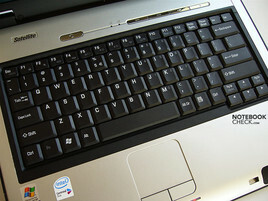 E.g., PgUp and PgDn were located above the arrow keys. However, the keys are considerably big, so there is only a small chance that one hits one of the cursor keys instead of a desired digit. 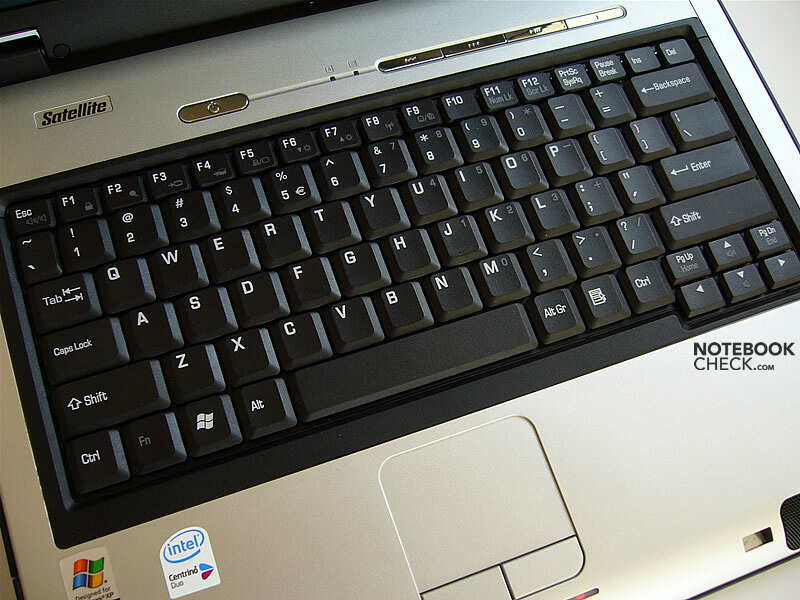 Generally, typing is comfortable, although the whole unit yields a little (mostly at the region of the right hand). The feedback is adequate and the keys' resistance can hardly be criticized. 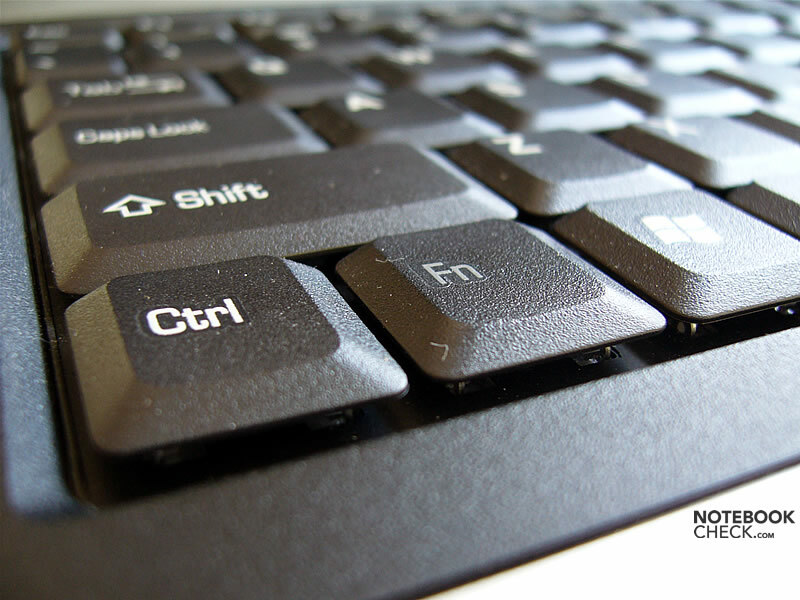 Typing should be efficient, and, what's equally important, quiet. 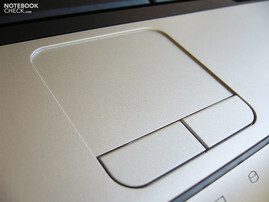 Most older Toshiba notebooks have diminutive touch pads. Also the touchpad of the L100 is really small. However, after some adaption time, you'll get used to it. The buttons have a comfortable short feedback, but, their pressure resistance is quite high. 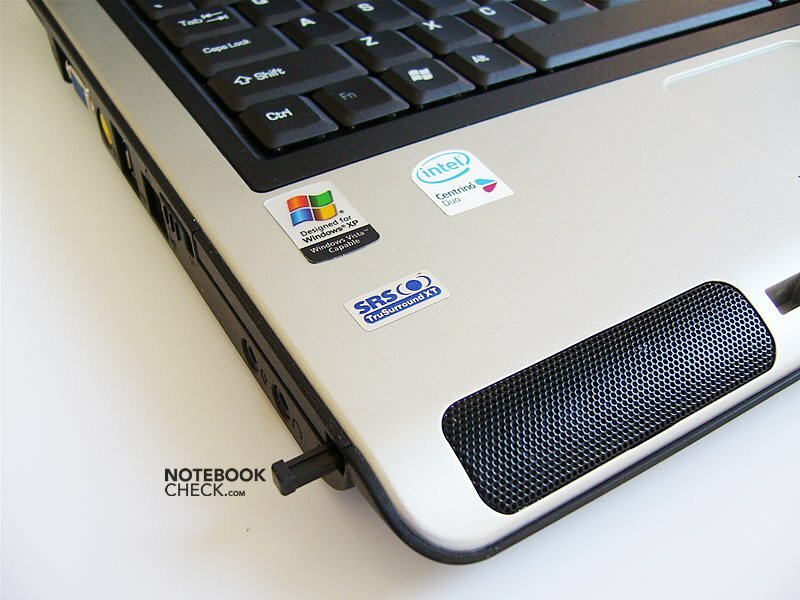 The matt screen is a considerable strength of the Satellite L100. 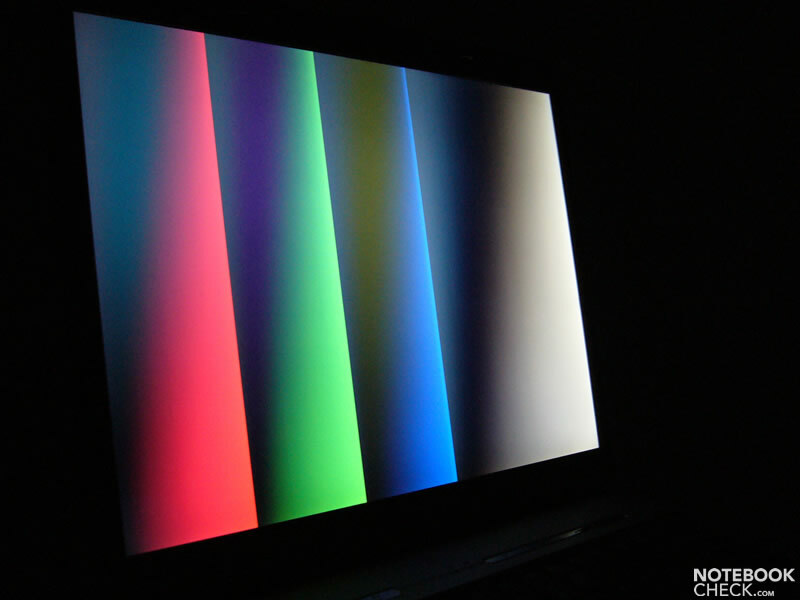 Although the brightness isn't stunning at first, you have to notice that glossy screens have generally better parameters. 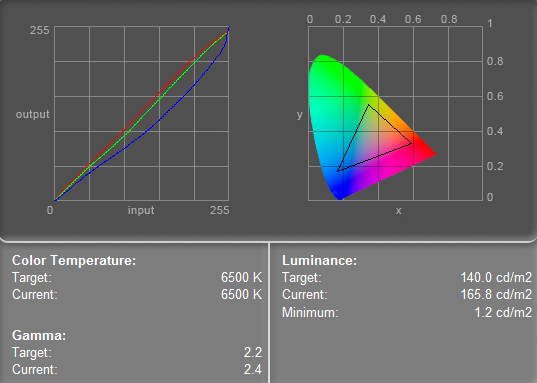 The maximum brightness amounted to 165.8 cd/m². The illumination is quite good, 78%. 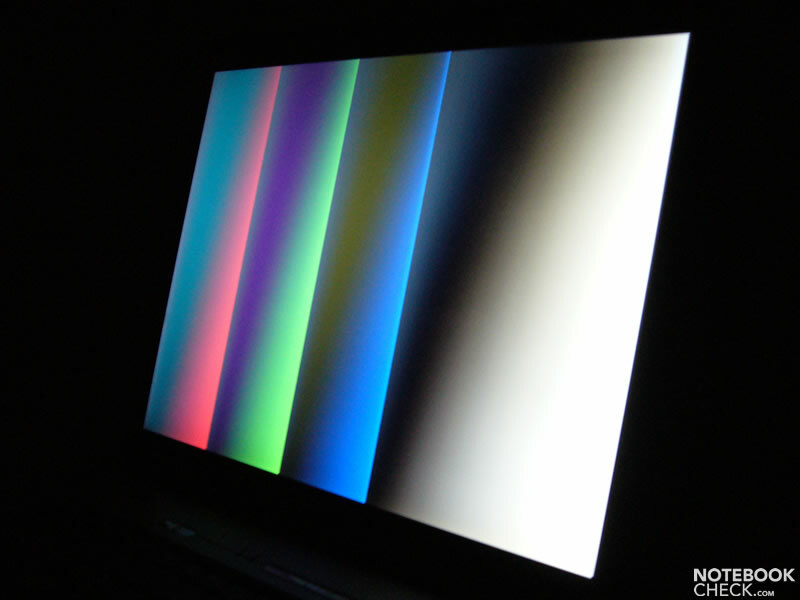 With a black value of 1.1 cd/m², the Satellite L100's display reaches a maximum contrast of 151:1. Not outstanding. It is to be mentioned that the 4:3 format is not ideal for watching movies. Regarding stability to the vantage point, you can vertically as well as horizontally observe a darkening and even the phenomenon of negative patterns will develop. 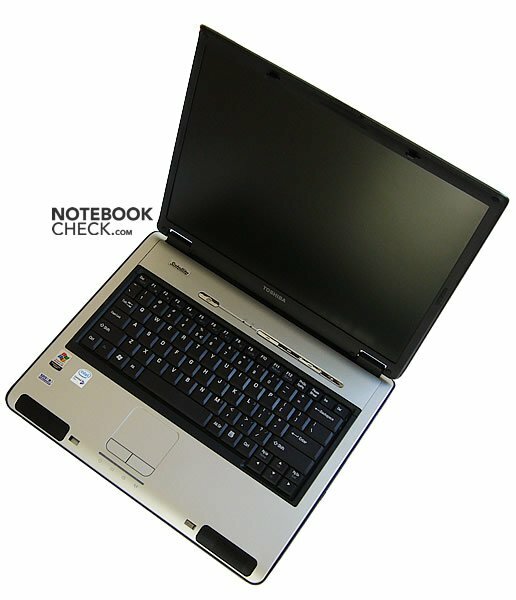 The reviewed notebook was equipped with a Core Duo T2400 CPU. There is also a version with a slower T2300 CPU available. Therefore, you should carefully check what actually is in your basket. 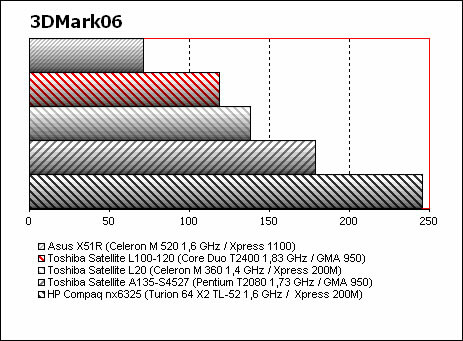 As you can see on the PCMark graph, this processor is a bit more powerful than the newer Pentium Dual Core T2080 or the dual-core Turion from competing office notebooks. 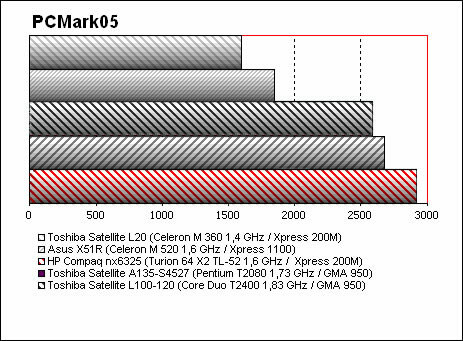 However, it is clearly outperformed by any Core 2 Duo CPUs, even those of the first generation. The performance of the integrated Intel GMA 950 GPU is not outstanding at all, but unless you have high demands on 3D (e.g. for games), it is yet sufficient. The 60 GB Fujitsu HDD is average regarding transfer rate and access time. Further information about the video card can be found here or in our comparison of mobile video cards. Detailed information about the Core Duo CPU can be found here. 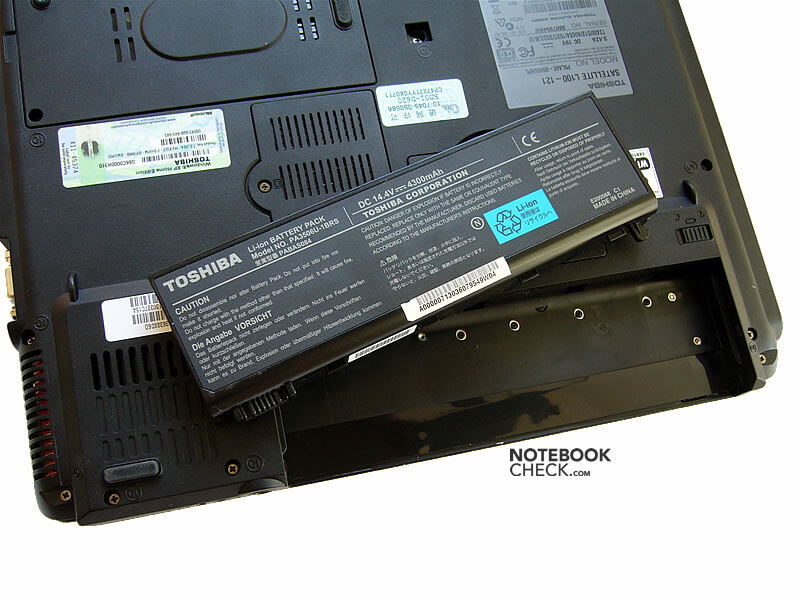 Generally speaking, the Satelite L100 is a quiet notebook, just like other Toshiba laptops. 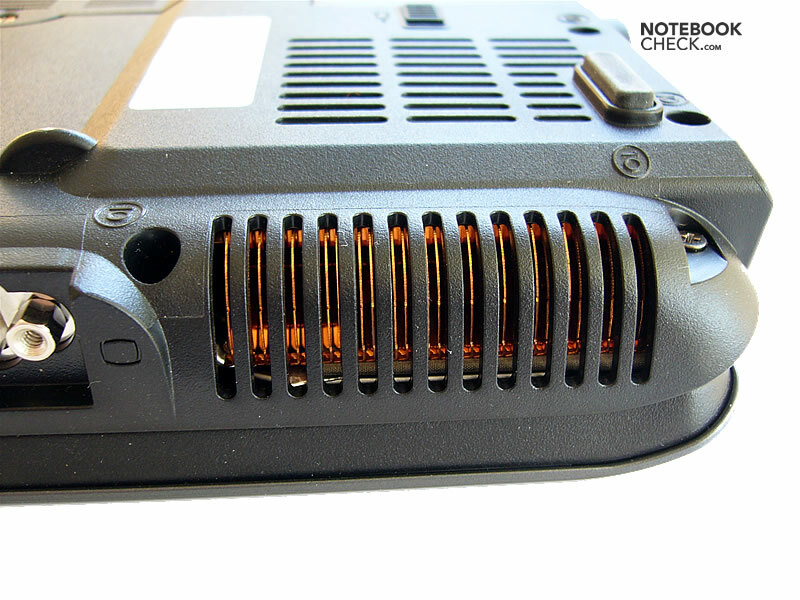 While working without load the fan breaks the silence every 4-5 minutes, resonantly blowing out the air (the whole operation lasts about a second). Under heavy load the fan works all the time at the same speed, and is not overly audible. 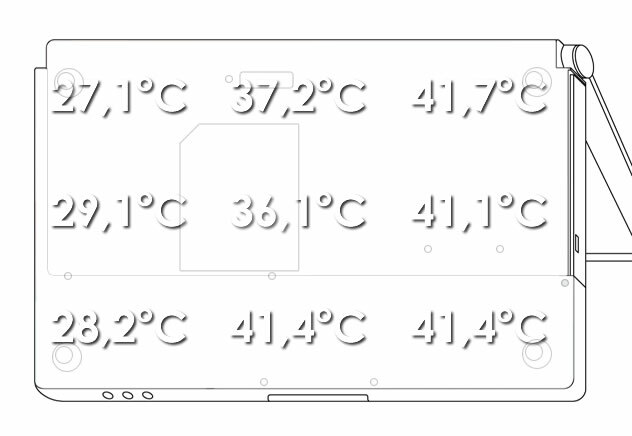 The HDD's temperature starts with 28° Celsius and increases to up to 51° Celsius. 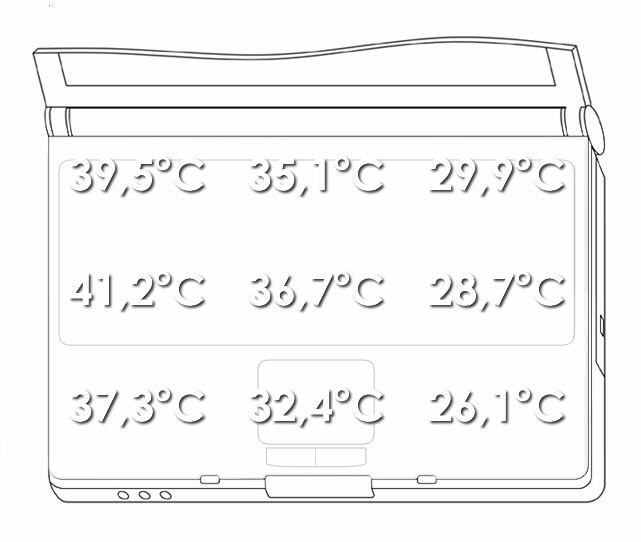 The temperature of the base unit reaches up to 42° Celsius at the left-hand side. The maximum at the bottom side is about the same. You can feel this warmness under the left hand, but it is by no means troublesome. However, if you work at your lap in a warm room with warm pants, it starts getting uncomfortable after half an hour. Outdoors, at an airy place or when the laptop is put on the bare thighs, one can possibly endure this heating for a longer time. Considering the price of the computer, the speakers are alright. Sometimes, they sound a little brassy. Regarding this aspect the integrated GPU is advantageous. Despite of being equipped with only a 4300mA hbattery, you can work unplugged for several hours with your L100. 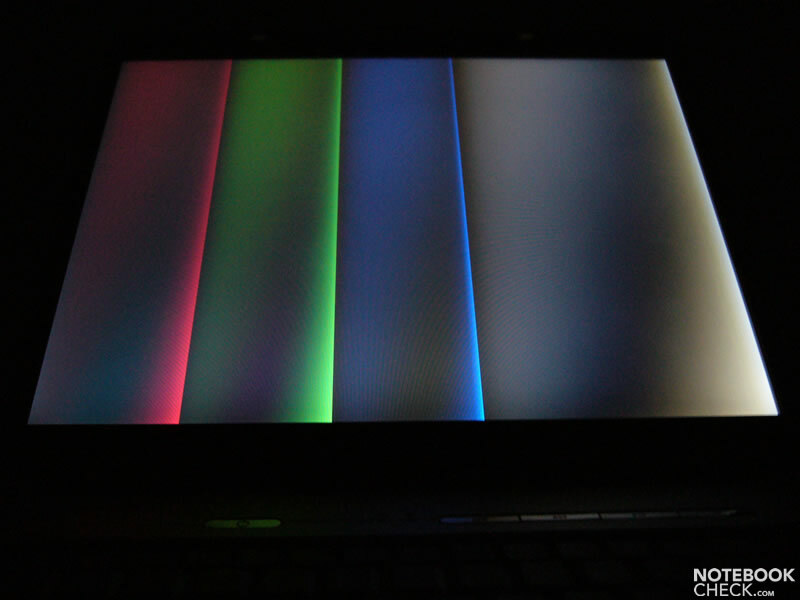 Because working at lowest brightness is still comfortable, the result of the BatteryEater Reader's Test of over four hours is close to the possible maximum battery runtime in practice. 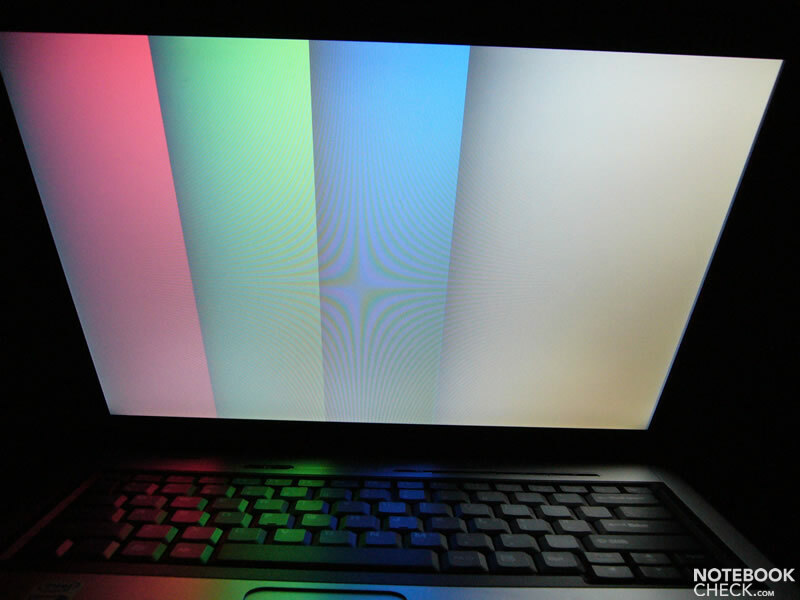 However, if you configure your notebook for maximum performance, only about one and an half hour battery runtime is possible. Satellite L100-121 has a matt screen in 4:3 format. 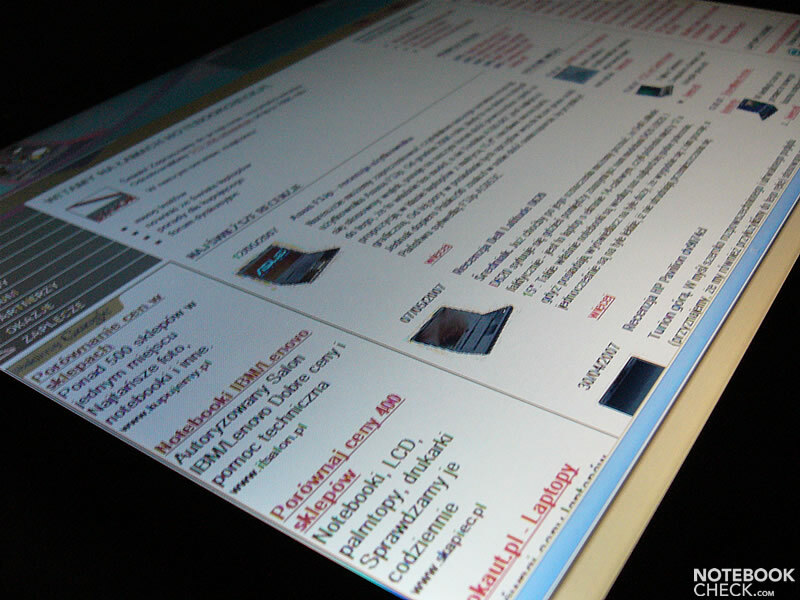 Because wide screen displays have some significant advantages, these notebooks disappear more and more from the market. 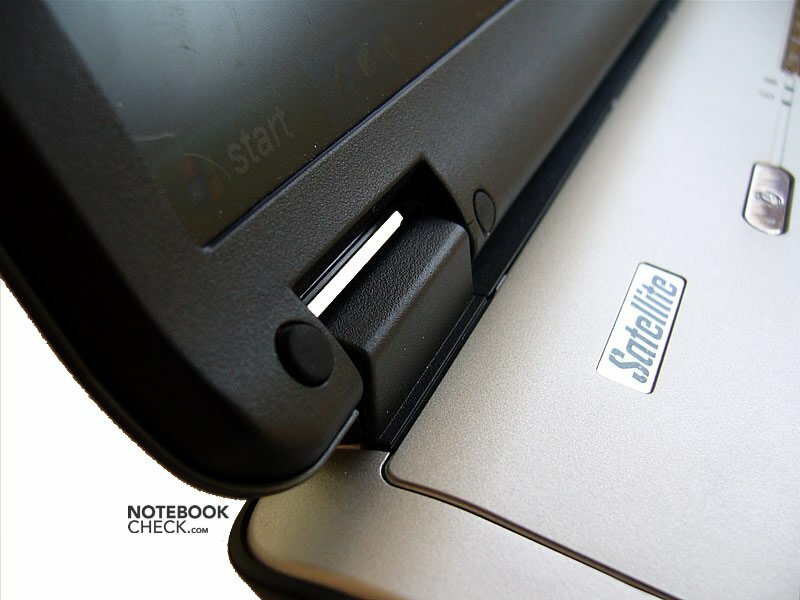 Nevertheless, the Satellite L100-121 is a handy, mobile notebook with a bright, matt screen, capable CPU, quiet operation and favorably long battery run time. The benefits exceed the drawback by far. The most annoying things we discovered are the see-saw of the screen after adjusting its position and the wobbling of the screen, if closed. 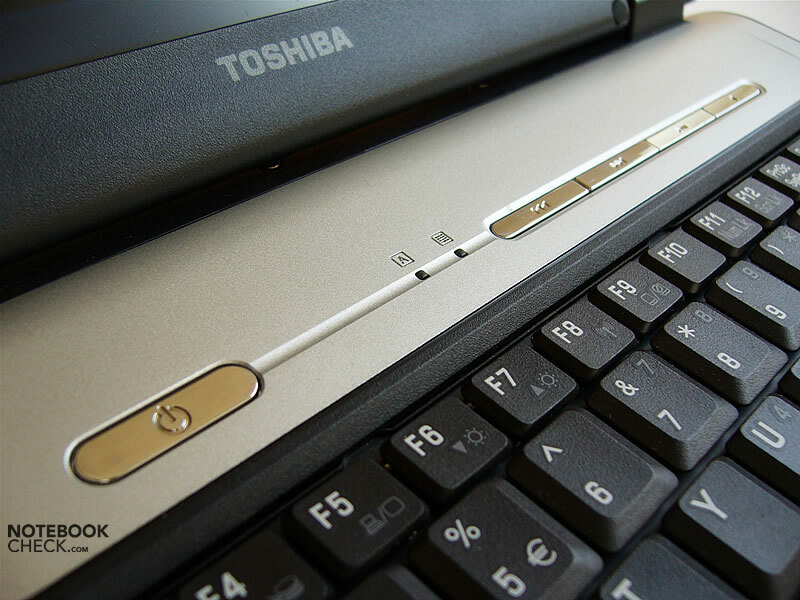 Although we got used to the 4:3 format over the years, the Toshiba Satellite L100 demonstrates that the shift towards wide screens is reasonable. Typical Toshiba, also the L100 is definitely quiet during office operation. The speakers sound quite nice. You'd better treat the PC Card release careful, if you do not want it to protrude just like on the picture above. Nevertheless, typing is quite comfortable. The keyboard had to be compactly designed. 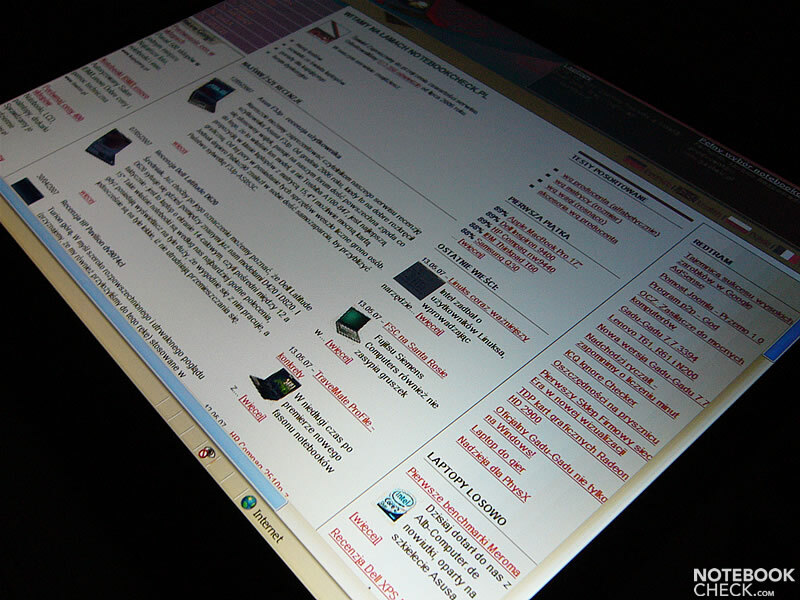 A wide-screen format would provide a bigger width. Number and kind of interfaces are generally alright, but a card reader is missing. 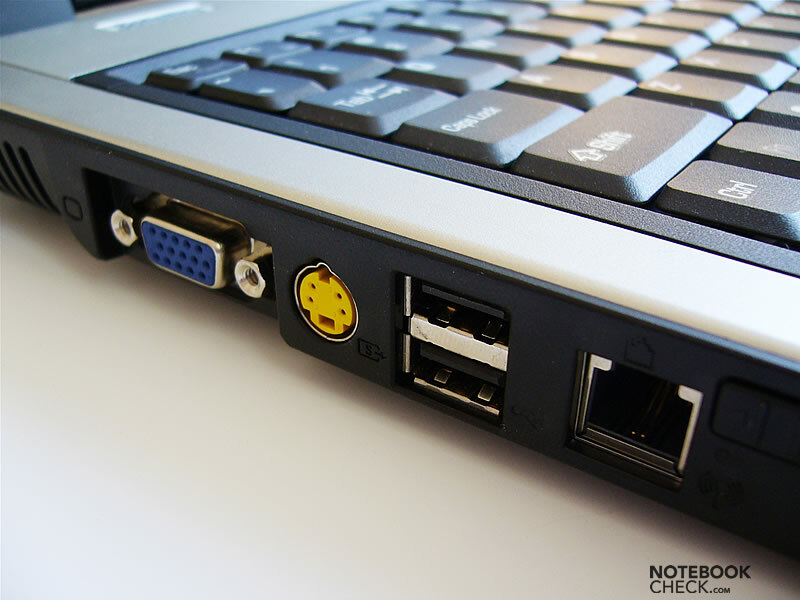 Because the base unit is relatively small, most of the ports had to be located at the notebook's sides. 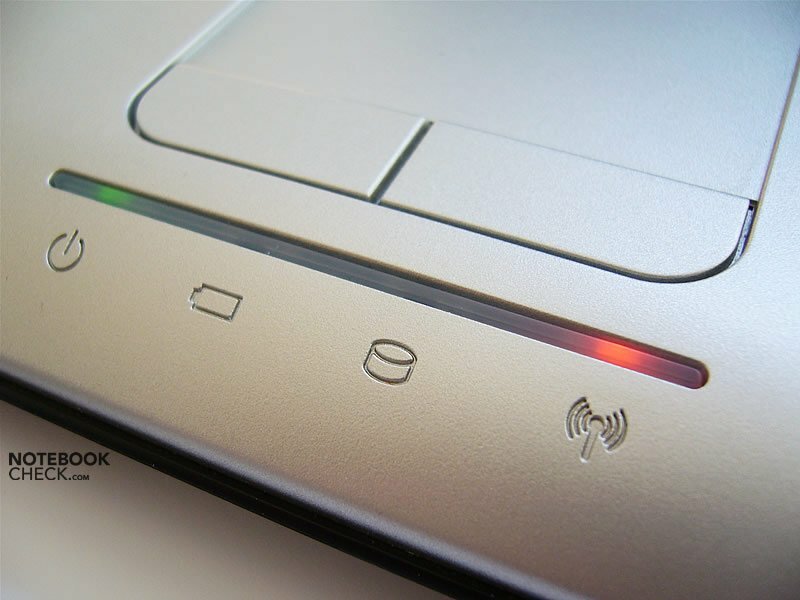 The indicator lights are not visible after closing the lid. But, while charging the battery you'll have to monitor them from time to time. The hinges should be improved. The power switch and multimedia buttons are in a molding. 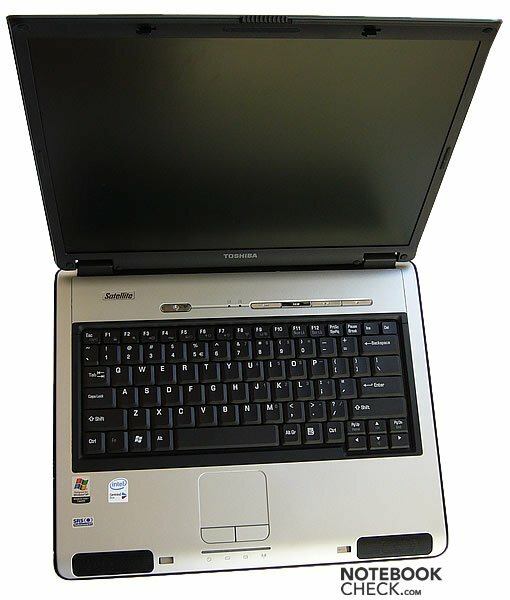 The distinguishing marks of the Satellite series: a streamlined base unit , a silver top case, and a black keyboard. A slightly above-average battery runtime, ensures that you can work unplugged with the Satellite L100 for a considerable period of time.